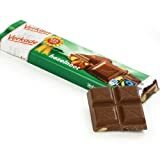 This scrumptious Verkade chocolate is quite popular among the Dutch and has a smooth taste and creamy texture. Royal Verkade is one of Holland\'s oldest chocolate businesses, although they actually began as a bakery. The firm has continued their legacy of top quality by recently transitioning all of their chocolate to be a hundred% Honest Trade. Treat yourself or the ones you love with this classic Dutch treat!